The hips joints join the legs to the trunk of the body, and are formed by the femurs and pelvic bones. The hips are ball-and-socket type joints, where the femoral head (ball) fits into the cup-shaped acetabulum (socket) of the pelvis (Figure 1). When compared to the shoulder, which is also a ball-and-socket joint, the acetabulum is a deeper socket, and encompasses a greater area of the ball, or femoral head. 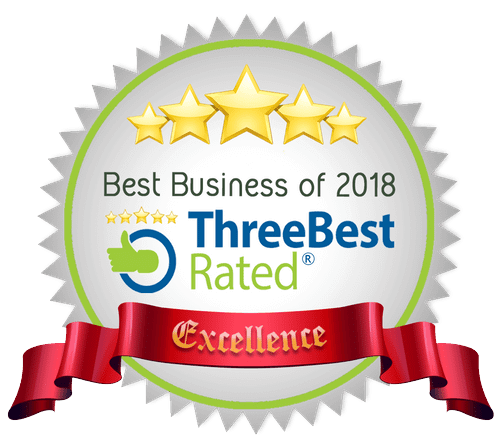 This accommodation is necessary to provide stability for the hip, as it is a major weight-bearing joint, and one of the largest joints in the body. When not weight-bearing, the ball and socket of the hip joint are not perfectly fitted. 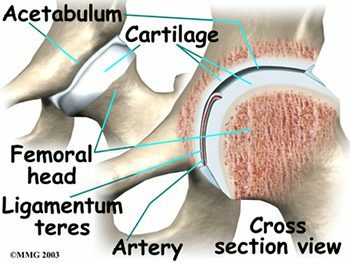 However, as the hip joint bears more weight, the surface area contact increases, and the joint becomes more stable. When in a standing position, the body’s center of gravity passes through the center of the acetabula. While walking, weight-bearing stresses on the hips can be five times a person’s body weight. Healthy hips can support your weight and allow for pain-free movement. Hip injuries or disease can cause changes that affect your gait, as well as changes that affect the ability of the hips to distribute weight bearing. Abnormal stress is then placed on the joints that are above and below the hips. The three fused hips or innominate bones that form the acetabulum include the ilium, pubis, and ischium. The ilium forms the superior aspect, the pubis forms the inferior and anterior aspect, and the ischium forms the inferior and posterior aspect. The depth of the acetabulum socket is further increased by the attached fibrocartilaginous labrum (Figure 2). In addition to providing stability to the hip joint, the labrum allows flexibility and motion. Hip joint stability can be hampered by injuries resulting from playing sports, running, overuse, or falling, as well as by disease or tumor. MRI of the hips may be ordered to assess the joint(s) for internal derangement, fracture, or degenerative joint disease. A blow to the hip joint or a fall can result in dislocation of the hip, or a hip fracture. Osteoporosis or low bone density can also lead to hip fractures. Successful prevention and/or treatment of osteoporosis may be achieved through nutrition (adequate amounts of calcium, vitamin D and phosphorus), exercise, safety measures, and medications. Articular cartilage covers the femoral head and the acetabulum (Figure 3). This cartilage is thin but tough, flexible, smooth and slippery, with a rubbery consistency. It absorbs shock, and allows the bones to move against each other easily and without pain. It is kept lubricated by synovial fluid, which is made in the synovial membrane (joint lining). Synovial fluid is both viscous and sticky. This fluid is what allows us to flex our joints under great pressure without wear. The articular cartilage of the hip is typically about ¼ inch thick, except in the posterior aspect of the hip socket (Figure 4). Here, the cartilage is thicker, as this area absorbs most of the force during walking, running, and jumping. MRI of the hip joint can detect problems involving both the articular cartilage and the fibrocartilaginous ring, or labrum. Cartilage has minimal blood vessels, so it is not good at repairing itself. 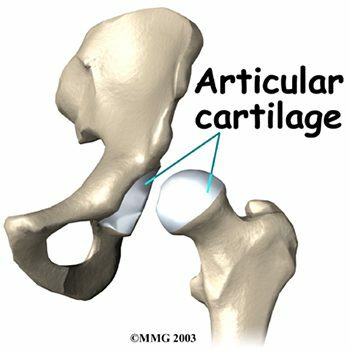 Fraying, fissuring, and other abnormalities or defects of the cartilage can lead to arthritis in the hip joint. Contrast can be directly injected in the hip joint for a detailed look at the cartilage and labrum. The femurs are the longest bones in the body, with large round heads that rotate and glide within the acetabula of the pelvis. The femoral head is particularly subject to pathologic changes if there is any significant alteration of blood supply (avascular necrosis). The femoral neck connects the head of the femur to the shaft. The neck ends at the greater and lesser trochanters, which are sites of muscle and tendon attachments. A disease characterized by an inadequate blood supply to the femoral head is Legg-Calve-Perthes disease, also known as LCP or simply Perthes disease. This is a degenerative disease of the hip joint that affects children, most commonly seen in boys ages two through twelve. One of the growth plates of the femoral head, the capital femoral epiphysis, is inside the joint capsule of the hip. Blood vessels that feed this epiphysis run along the side of the femoral neck, and are in danger of being torn or “pinched off” if the growth plate is damaged. This can result in a loss of blood supply to the epiphysis, leading to a deformity of the femoral head (Figure 5). 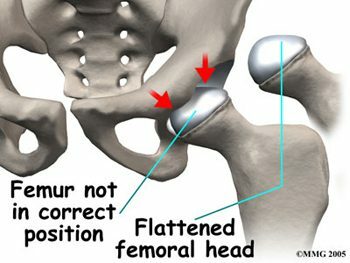 The femoral head may become unstable and break easily, which can lead to incorrect healing and deformities of the entire hip joint (Figure 6). Treatment of Perthes disease is centered on the goal of returning the femoral head to a normal shape. 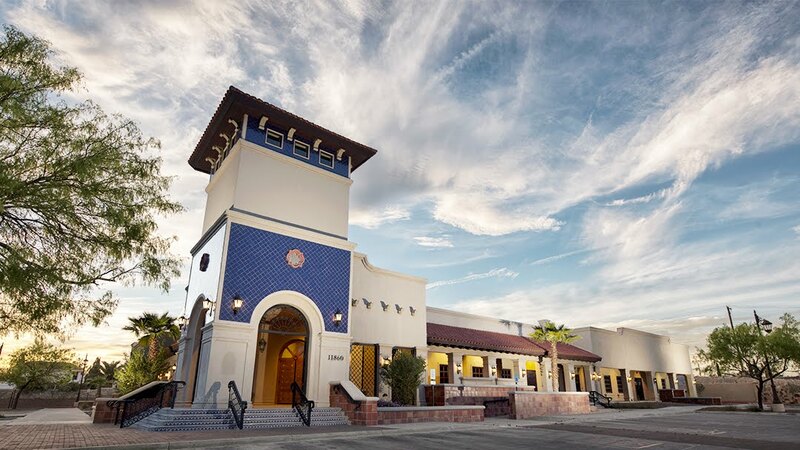 Surgical and non-surgical treatments are used, based on the idea of “containment”- holding the femoral head in the acetabulum as much as possible, while still allowing motion of the hip joint for cartilage nutrition and healthy growth of the joint. 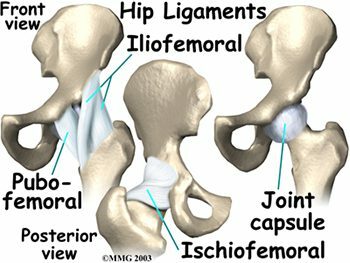 High level athletes and active individuals may be susceptible to a hip condition known as Femoro-Acetabular Impingement, or FAI. FAI is characterized by excessive friction in the hip joint. The femoral head and acetabulum rub abnormally, and can create damage to the articular or labral cartilage. FAI is also associated with labral tears, early hip arthritis, hyperlaxity and low back pain. 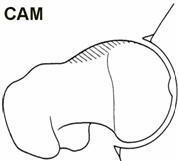 FAI generally occurs in two forms: Cam and Pincer. 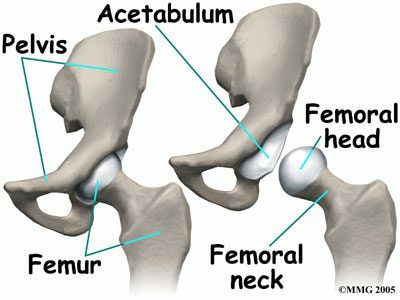 The Cam form results in abnormal contact between the femoral head and the socket of the hip because the femoral head and neck relationship is aspherical (Figure 7). Males and those involved in significant contact sports typically display Cam impingement. 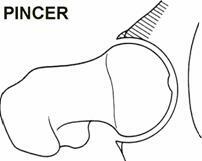 Pincer impingement occurs when the acetabulum covers too much of the femoral head, resulting in the labral cartilage being pinched between the rim of the socket and the anterior femoral head-neck junction (Figure 8). Pincer impingement may be more common in women. 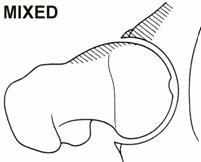 Typically, these two forms exist together, and are labeled as “mixed impingement” (Figure 9). Ewing’s sarcoma is a malignant bone tumor that may affect the pelvis and/or femur, thereby also affecting the stability of the hips. Like Perthes disease, Ewing’s sarcoma is more common in males, typically presenting in childhood or early adulthood. MRI is routinely used in the work-up of these malignant tumors to show bony and soft tissue extent of the tumor, and its relation to nearby anatomic structures (Figure 10). Contrast may be used to help determine the amount of necrosis within the tumor, which aids in determining the response to treatment before surgery. Figure 10. MRI demonstrating Ewing’s sarcoma. Hip stability is further increased by three strong ligaments that encompass the hip joint and form the joint capsule. These ligaments connect the femoral head to the acetabulum, with names suggestive of the bones they connect. They include the pubofemoral and iliofemoral ligaments anteriorly, and the ischiofemoral ligament posteriorly (Figure 11). The iliofemoral ligament is the strongest ligament in the body. However, sports and overuse can still result in sprains of these sturdy ligaments of the joint capsules of the hips. A smaller ligament, the ligamentum teres, is an intracapsular ligament that connects the tip of the femoral head to the acetabulum (Figure 12). A small artery within this ligament brings some of the blood supply to the femoral head. 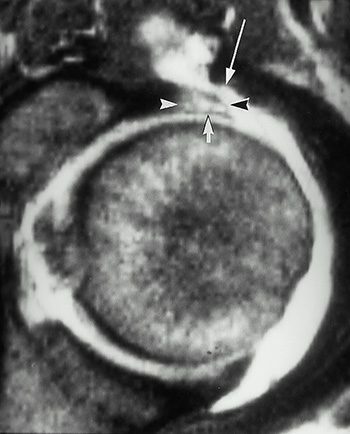 Damage to the ligamentum teres, and its enclosed artery, can result in avascular necrosis. The muscles of the thigh and lower back work together to keep the hip stable, in alignment, and able to move. The hip gains stability because the hip muscles do not attach right at the joint. Hip muscles allow the movements of flexion, extension, abduction, adduction, and medial and lateral rotation. To better understand the functions of the muscles surrounding the hip, they can be divided into groups based on their locations- anterior, posterior, and medial. 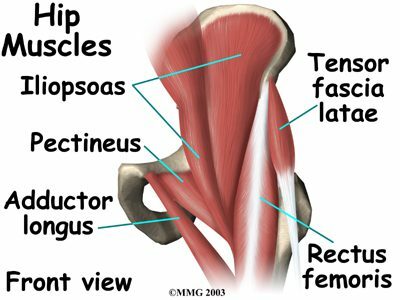 The anterior thigh muscles are the main hip flexors, and are located anterior to the hip joint. Seventy percent of the thigh’s muscle mass is made up of the quadriceps femoris muscle, so named because it arises from four muscle heads- the rectus femoris, vastus medialis, vastus intermedius, and vastus lateralis (Figures 13, 14). The rectus femoris is the only one of the “quad” muscles to cross the hip joint. The sartorius muscle is found anterior to the quadriceps, and also serves as an abductor and lateral rotator of the hip. The most powerful of the anterior thigh hip flexors is the iliopsoas, which originates in the low back and pelvis and attaches at the lesser trochanter. Posterior hip muscles include those of both the thigh and gluteal regions. The posterior thigh muscles are also known as the hamstrings- semimembranosus, semitendinosus, and biceps femoris (Figure 15). These muscles originate at the inferior pelvis, and are the extensors for the hip. They are active in normal walking motions. When the hamstrings are “tight”, they limit hip flexion when the knee joint is extended (bending forward from the waist with knees straight), and can limit lumbar movement, leading to back pain. 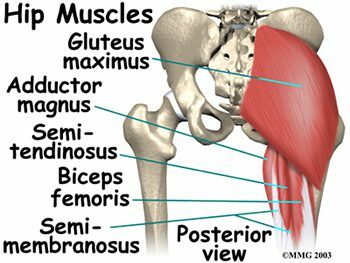 The gluteal muscles include the gluteus maximus, medius, and minimus, six deep muscles that serve as lateral rotators, and the tensor fasciae latae. The three gluteals and the anterior sartorius muscle are all involved in abduction. The gluteus maximus is the main hip extensor, and is the most superficial of the gluteal muscles. It is involved in running and walking uphill, and assists with normal tone of the iliotibial band, which lies lateral to it. The gluteus medius and minimus both insert at the greater trochanter of the femur. The minimus is the deepest of the three gluteal muscles. Anterior to the gluteus minimus is the tensor fasciae latae muscle. It is a flexor and medial rotator of the hip, originating from the anterior superior iliac spine (ASIS) and inserting on the iliotibial band. The term “tensor fasciae latae” defines this muscle’s job- “muscle that stretches the band on the side”. 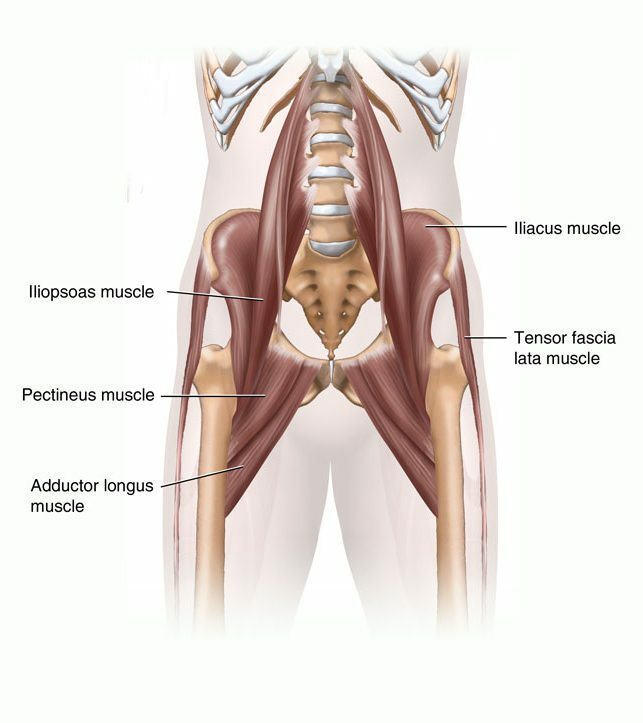 This muscle helps the iliopsoas, gluteus medius, and gluteus minimus muscles during flexion, abduction and medial rotation of the thigh by making the iliotibial band taut, thereby steadying the trunk and stabilizing the hip (Figure 16). 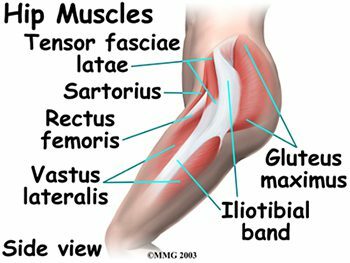 The iliotibial band or tract is not a muscle, but a thickened, fibrous band of deep fascia, or connective tissue. It is found at the lateral aspect of the thigh, and runs from the ilium to the tibia. It encloses the muscles and helps with lateral stabilization of the knee joint, as well as helping to maintain both hip and knee extension. Tightening of the iliotibial (IT) band typically causes more problems at the knee as opposed to the hip, but hip pain can result from the IT band rubbing as it passes over the greater trochanter. The medial thigh (groin) muscles include five muscles of adduction, and one lateral rotator (Figures 17, 18). The lone lateral rotator is the obturator externus, which covers the external surface of the obturator foramen in the deep upper medial thigh. 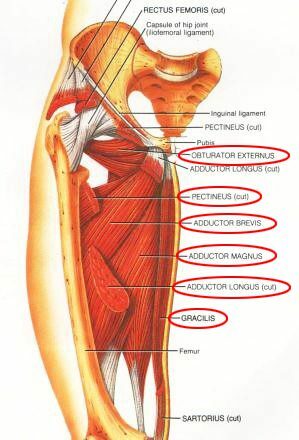 The adductors include the gracilis, the pectineus, and the adductor brevis, longus and magnus. The gracilis is the longest adductor, extending from the medial inferior aspect of the pubic bone, to the medial aspect of the tibia. 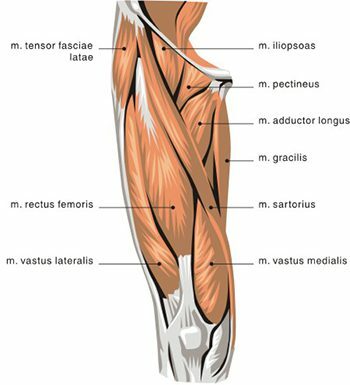 The adductor magnus is the most massive of the medial muscles of the thigh. The tendons and muscles of the hips are very powerful and create great forces, making them prone to inflammation and irritation. Tendonitis of the hip can result from repetitive movements involving the soft tissues surrounding the hip joint. Overuse of the hip joint in fitness workouts can lead to tendonitis. Tendons lose their elasticity as we age, resulting in swelling and irritation when the tendons are no longer “gliding” on their normal paths. Iliopsoas tendonitis plays a major role in snapping hip syndrome, or dancer’s hip. A snapping sensation when the hip is flexed and extended may be accompanied by an audible snapping or popping noise, as well as pain. This can be both an extra-articular and an intra-articular occurrence. Extra-articular snapping is often found in those patients with a leg length difference (the longer leg is symptomatic), those with tightness of the iliotibial band on the involved side, and those with weak hip abductors and external rotators. Lateral extra-articular snapping can be caused by the iliotibial band, tensor fascia latae or gluteus medius tendon as they slide back and forth across the greater trochanter (Figure 19). If any of these connective tissue bands thickens, they can “catch” on the greater trochanter during the motion of hip extension, thereby creating the “snapping” sensation and sound. Medial extra-articular snapping, which is less common, can occur when the iliopsoas tendon catches on the anterior inferior iliac spine, lesser trochanter, or iliopectineal ridge during hip extension. Intra-articular snapping hip syndrome is similar in many ways to the extra-articular type, but often involves an underlying mechanical problem in the lower extremity, and more intense pain. Intra-articular snapping may be indicative of a torn acetabular labrum, recurrent hip subluxation, a tear of the ligamentum teres, loose bodies, articular cartilage damage, or synovial chondromatosis (cartilage formations in the synovial membrane of the joint). Snapping hip syndrome is usually found in those ages 15-40, often in those in training for the military. It can also affect athletes, especially those involved in dance, gymnastics, soccer, and track and field. These athletes will all be performing repeated hip flexions, which can lead to tendonitis in the hip area. The repetitive motions of those involved in weightlifting and running generally lead to a thickening of the tendons in the hip region, rather than snapping hip syndrome. Prevention, or at least a lessening, of this syndrome may be found with increased stretching of the iliopsosas muscle or the iliotibial band. Surgery is usually not required, unless intra-articular pathology is present. Tendon or muscle strains can occur suddenly, as in sports injuries, or they can develop over time, with symptoms including pain, swelling, muscle spasms, and difficulty moving certain muscles. 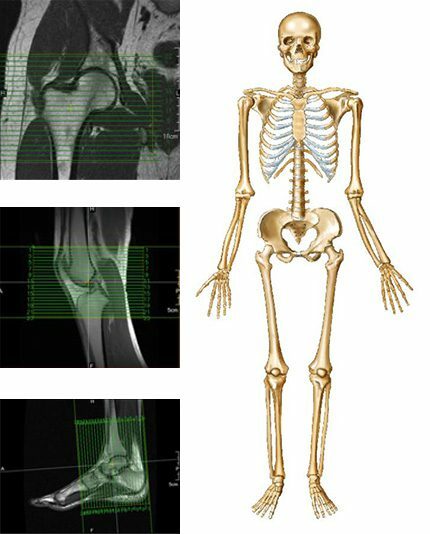 MRI can be used to detect tendon and muscle tears and strains, as well as bone tumors and infection. MRI has shown good accuracy for the diagnosis of tears of the gluteus medius and gluteus minimus tendons, which are both abductor tendons of the hip. An association was found between these tears and areas of high signal intensity superior or lateral to the greater trochanter on T2-weighted images, tendon elongation in the gluteus medius, and tendon discontinuity (Figure 20). 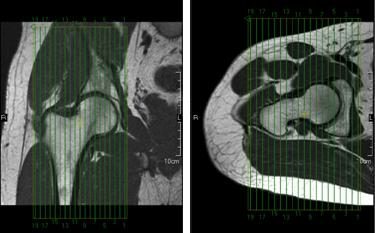 STIR and fat-suppressed T2-weighted coronal images are very sensitive for detection of areas of high signal intensity superior to the greater trochanter. 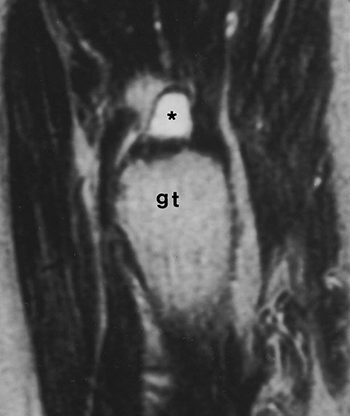 Coronal T1-weighted images demonstrate tendon elongation in the gluteus medius (Figure 21). Axial images may prove superior for localizing involvement to individual abductor tendons and confirming tendon discontinuity (Figure 22). Tears of the abductor tendons may be the leading cause of greater trochanteric pain syndrome. Figure 20. Sag. T2 shows high signal intensity superior to greater trochanter (gt) corresponding to swollen bursa (*). Figure 21. Coronal STIR shows high signal intensity superior to greater trochanter in bursa (*) between gluteus medius (me) and gluteus minimus (mi) tendons. Figure 22. Axial T2 shows high signal intensity corresponding to fluid replacing distal rt. gluteus medius tendon (black arrow); normal left tendon (white arrow). The nerves of the hip supply the various muscles in the hip area. The major nerves include the femoral, obturator, and lateral femoral cutaneous nerves anteriorly, and the large sciatic nerve posteriorly (Figure 23). The femoral nerve innervates the quadriceps femoris and sartorius, and is the sensory nerve to the anterior thigh. Trauma to this nerve usually occurs in the pelvis, as it passes through or near the psoas muscle. The obturator nerve passes along the lateral pelvic wall and through the obturator foramen, then splits into branches that supply the adductor muscle group. This nerve can also be subject to trauma in the pelvis due to its passage through the obturator foramen. The lateral femoral cutaneous nerve is a sensory nerve that travels along the anterolateral aspect of the thigh. It supplies sensation to the skin surface of the thigh. This is the single nerve involved in a painful condition called meralgia paresthetica, which is characterized by tingling, numbness, and burning pain in the outer part of the thigh. 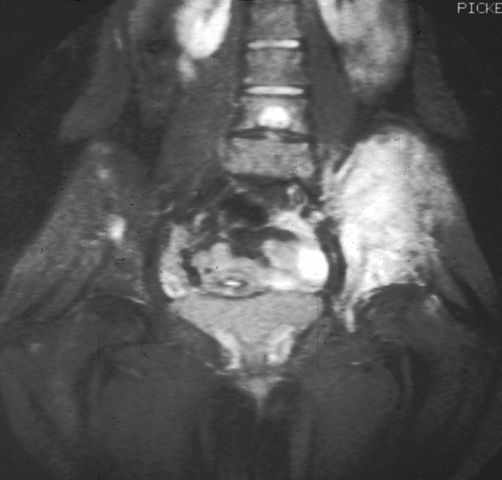 Meralgia paresthetica results from focal entrapment of the lateral femoral cutaneous nerve as it passes through the tunnel formed by the lateral attachment of the inguinal ligament and the ASIS. The posterior sciatic nerve passes deep to the gluteus maximus into the posterior thigh, where it innervates the hamstring muscles, on its way down to the lower leg and foot. The sciatic nerve is approximately as big around as the thumb, and is the largest single nerve in the human body. It can be injured in cases of posterior hip dislocation. Pressure on this nerve can cause nerve pain, numbness, tingling and weakness (sciatica symptoms) in the buttocks, leg, or foot, depending on the site of origin of the sciatic nerve compression. Figure 23. Anterior and posterior views of the nerves of the hip. 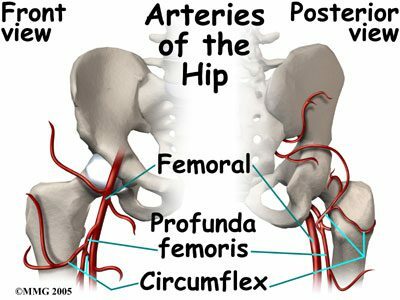 The arterial blood vessels that supply the hips are branches of the internal and external iliacs. The internal iliac artery gives off the superior and inferior gluteals, and the obturator artery. The inferior gluteal flows to the posterior aspect of the hip joint and proximal femur, where it joins a branch of the femoral artery. The obturator artery runs through the obturator foramen, and sends its acetabular branch to the ligamentum teres as part of the blood supply to the femoral head. The external iliac becomes the femoral artery, which has numerous branches that supply the hip and proximal femur. The largest femoral branch is the profunda femoris, which branches superiorly into the medial and lateral circumflex femorals (Figure 24). The circumflex femorals and the inferior gluteal artery contribute to the anastomoses to supply the femoral head, femoral neck, and the hip joint. The medial circumflex also has an acetabular branch to the ligamentum teres. Congenital anomalies in the hip anastomoses, degenerative processes, and trauma can all compromise the blood supply to the hip joint area. Figure 24. Anterior and posterior views of the arteries of the hip. 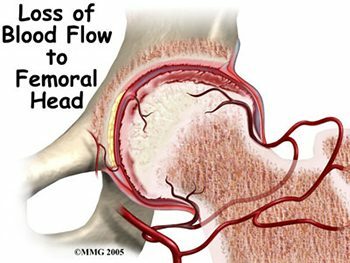 Venous flow in the hip and proximal femur typically follows the arterial flow, including the same names for the vessels. The deep veins of the hip and thigh can be the origination of a deep vein thrombosis, which can result in a pulmonary embolus. This can be caused by immobility after hip surgery, sitting in cars or airplanes for extended trips, being overweight, or slow or low blood flow. These blood clots can break off, travel through the larger veins of the thigh and hip, continue through the heart, and become lodged in the smaller vessels of the lung. MRI is being used more frequently to diagnose this very serious condition. The hip joint is surrounded by bursae, similar to the shoulder. These fluid-filled sacs are lined with a synovial membrane, which produces synovial fluid. Their function is to lessen the friction between tendon and bone, ligament and bone, tendons and ligaments, and between muscles. There may be as many as 20 bursae around the hip. If they become infected or inflamed, the result is a painful condition called bursitis. 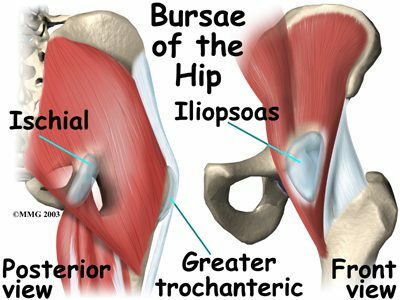 Common hip bursae that may become inflamed include the greater trochanteric bursa, the iliopsoas bursa, and the ischial bursa (Figure 25). The greater trochanteric bursa is sandwiched between the greater trochanter of the femur, and the muscles and tendons that cross over it. If this bursal sac becomes inflamed, patients experience pain with every step they take, as each step requires the tendon to move over the femur at the hip joint. 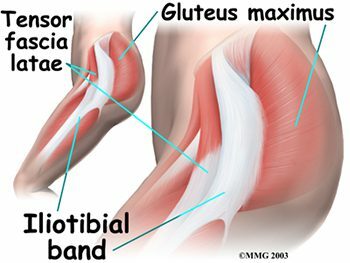 A tight iliotibial band can also cause irritation of the greater trochanteric bursa. Iliopsoas bursitis can result from irritation of the bursa found between the hip joint and the iliopsoas muscle that passes in front of it. Another common site for bursitis is the ischial bursa, which acts as a lubricating pad between tendons and the ischial tuberosity, which is the bony prominence of the pelvis that you sit on. The ischial bursa acts to prevent destruction of the tendons as they move over the ischial tuberosity. Prolonged sitting can cause ischial bursitis. 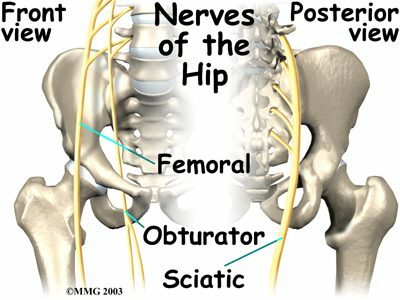 Inflammation around the ischial tuberosity can irritate the sciatic nerve, and trigger symptoms similar to sciatica. Hip bursitis is seen in runners and athletes in sports that involve excessive running (soccer, football, etc.). It can also be caused by an injury (traumatic bursitis), and is seen in post-op hip replacement and hip surgery patients. Treatment for hip bursitis typically includes rest, anti-inflammatory medications, and ice. It may become necessary to aspirate the bursa, which can be combined with a cortisone injection. MRI may be needed if the diagnosis is unclear, or if the problem does not resolve with normal treatments. Figure 25. Bursae of the hip. When positioning unilateral axial slices for the hip, a coronal image can be used to ensure inclusion of all pertinent anatomy. The slices should extend superiorly to include the entire femoral head and acetabulum, and inferiorly to include anatomy below the lesser trochanter. The slices should be aligned perpendicular to the shaft of the femur, as seen in the coronal image in Figure 39. Figure 39. Axial slice setup using sagittal and coronal images. For bilateral axial hip slice setup, parameters may have to be altered to maintain adequate resolution with the larger FOV that is required (Figure 40). The slice group may require angulation to maintain alignment of the femoral heads on the resultant images. Figure 40. Bilateral axial slice setup using a coronal image. 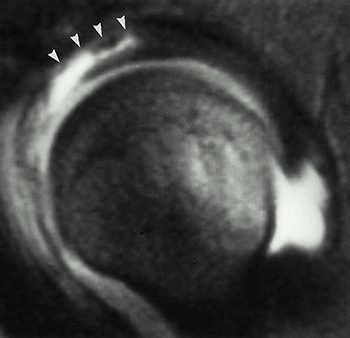 Coronal slices of the hip should cover the area from the posterior margin to the anterior margin of the femoral head. 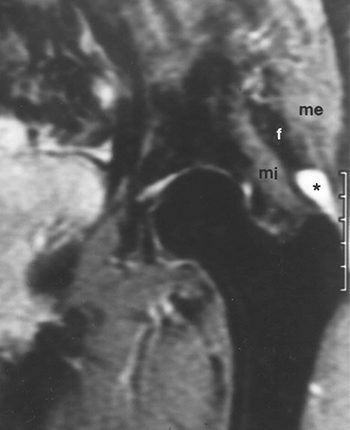 The area from the proximal margin of the femoral shaft to the greater sciatic notch should be included in the image (Figure 41). Slices may be angled so that they are parallel to the femoral neck. Thinner slices may be requested for coronal scanning. Figure 41. Coronal slice setup using axial and sagittal images. Sagittal slices of the hip should extend past the greater trochanter laterally, and through the acetabulum medially. The slices should be aligned along the long axis of the femur, and perpendicular to the coronal slices, as seen in the coronal image in Figure 42. Two different slice groups will be necessary when performing bilateral sagittal scans. Figure 42. Sagittal slice setup using coronal and axial images. MR hip arthrography is often times referred to as the gold standard for assessment of the labrum of the hip. The most clinically significant abnormal findings that result from hip arthrography are labral detachments and tears. 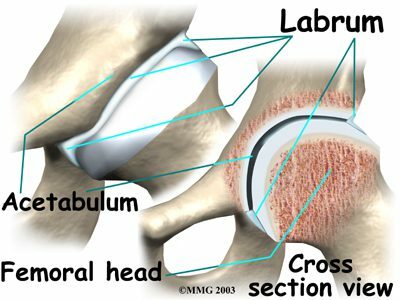 Detachment of the labrum, which is more common than a labral tear, can be diagnosed from the appearance of the injected contrast at the acetabular-labral interface (Figure 43). 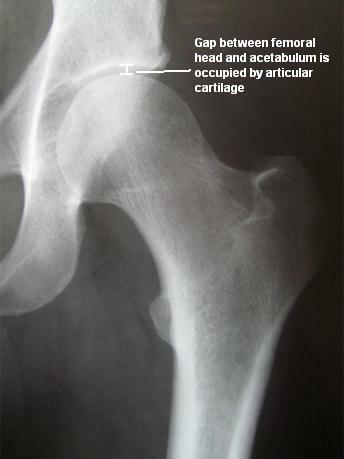 A labral tear can result in injected contrast appearing within the substance of the labrum (Figure 44). Contrast injection is necessary to differentiate torn or detached labra from other pathologic conditions, which may have separate signal intensities. 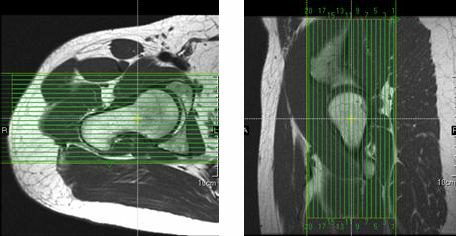 The sensitivity and accuracy for the diagnosis of labral tears and detachment with MR arthrography vs. nonarthrographic MR is 90%. Hip arthrography with MR can also depict intrarticular loose bodies, osteochondral abnormalities, and abnormalities of soft-tissue structures. Hip arthrography can be performed under fluoro in the x-ray dept., with the patient being moved to the MRI dept. for further imaging, or the entire procedure can be performed in the MRI suite, if MR compatible supplies are available for interventional techniques. The patient should be securely positioned with the hips in internal rotation. T1-weighted imaging is performed post-contrast to visualize the high signal of the intraarticular contrast. T1 gradient echo sequences offer the benefits of thin sections, elimination of partial volume averaging, and increased detection of small tears. Fatsat sequences are helpful in increasing the contrast between the injected contrast and the adjacent soft tissue. STIR or fatsat T2 sequences performed in the coronal plane may help to detect unsuspected pathologic conditions in the soft tissue and adjacent osseous structures. Post-contrast axial oblique images have been shown to optimize the detection of the most common sports-related acetabular labral tears, which are anterior or anterosuperior in location. Using a mid-coronal localizer, the axial oblique slices should be prescribed parallel to the long axis of the femoral neck. Figure 43. Labral detachment as seen in a fat-suppressed T1-wtd. sag. image; arrowheads indicate involvement of anterior and anterosuperior labrum. Figure 44. Labral tear as seen in a T1-wtd. image; arrowheads indicate enlarged labrum; short arrow indicates linear intralabral collection of contrast material; long arrow indicates communication between the joint and the iliopsoas bursa.